Good news for Android users, it looks like Google will be enhancing its Verify Apps feature to make it check on your existing apps, making sure your device is secure and isn’t infected with some malwares in the apps you’ve installed. The Play Store is filled with thousands of apps for you to pick from but unfortunately, not all of them are legitimate and sometimes by the time Google finds out and removes them from the store, some would’ve already installed it. The current Verify Apps feature that is available in the Security Settings of your Android device, can only check on apps when you install them, and will issue a warning or block potentially harmful apps. 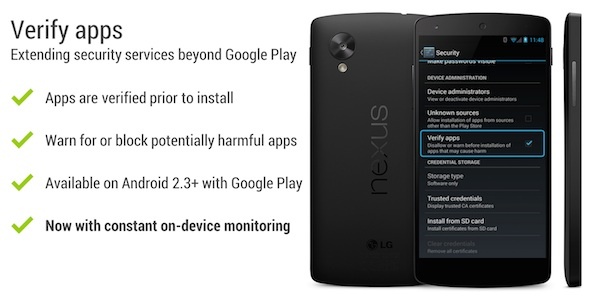 The enhanced version will soon come with “constant on-device monitoring” that will check on existing apps as well. Although getting potentially harmful apps installed into a device is a rare occurrence – Google says that less than 0.18% of installs in the last year occurred after someone received a warning that the app was potentially harmful, but the company still wants to strengthen the security level in Android devices. The feature will be rolled out soon and according to a previous report from ComputerWorld, the update will be rolled out in the form of an update to Google’s Play Services to any Android devices running on Android 2.3 and above. Sure, you can always install security apps into your device, but nothing beats having them right out of the box right?